It’s FREEZING in Maine this week. The only people walking around these days are the dog walkers and the postal carriers. Half the dogs I walk are disgusted by this weather and demand to be taken inside right away, the other half are oblivious to the cold, no matter how many times I tell them that I can’t feel my legs anymore. Since it’s 5 degrees out, I figured this might be a good time to talk dog coats. If you have dogs that are shaped like triangles, like I do, it can be hard to find coats that fit them. Both of my dogs are very broad in the chest but have narrow waists and I had to try a million coats before I found ones that were big enough up front, without being super long and huge all over. In Birdie’s case, she’s got so much junk in the front that she has a tendency to bust her coats open at the chest. So she starts off fine, but then she takes one breath and the front strap explodes open. Next thing you know, she’s running around with her coat “unzipped”, trailing from around her waist, like some sort of streaker. It’s embarrassing. So, if you have a top-heavy public exhibitionist of your own, there are a few brands that I’ve found worked well for my dogs. Of course, they might not fit your pups. That’s the thing about dog coats: usually your dogs have to try a few until they find the right one. And there’s no universal sizing system. If you’re in the market for a coat, I recommend visiting a pet store that offers a range of brands to try on. If your dog can’t handle doing a fashion show in a pet store, buy a bunch to take home and then return the ones that didn’t fit (let the store know what you’re up to and find out if they have a good return policy first!). Same goes with ordering online: buy a couple of sizes/styles and return what doesn’t work. Chilly Dog Sweaters: I know a lot of dogs with big chests that really rock these affordable sweaters. In fact, they’re a wardrobe staple among those of us with bull dogs (any kind of bull). They almost always run long, covering their tushies a bit, but the sweaters stretch and fit their chests really nicely. Plus they have adorable designs, like this monkey. The sweaters run small: so usually you need to go up a size larger than normal for the right fit. I think Boogie is an XL or XXL. Teckelklub Trench Coats: This was the first coat I found that could contain Birdie’s bust line with ease. No Velcro busting to be found with this baby. Both of my dogs have the fleece-lined Trench style coats. 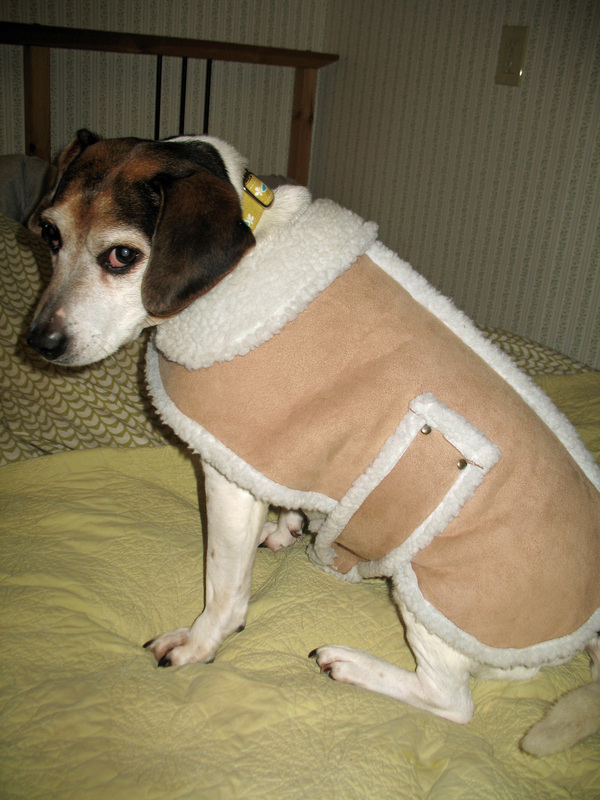 On really cold days, Boogie will wear his Chilly Dog sweater underneath and this coat on top. But most of the time, the coat alone does the trick for him when he’s out making sweet love to his big red ball in the snow. Boogie is a size 6, Birdie is a size 5 in this coat. Apache River Dog Coats: The next time I have to buy a coat for a dog, this is what I’m going to get. I used to work in a pet store that sold Apache River and on the coldest days these simple coats would fly off the shelves. 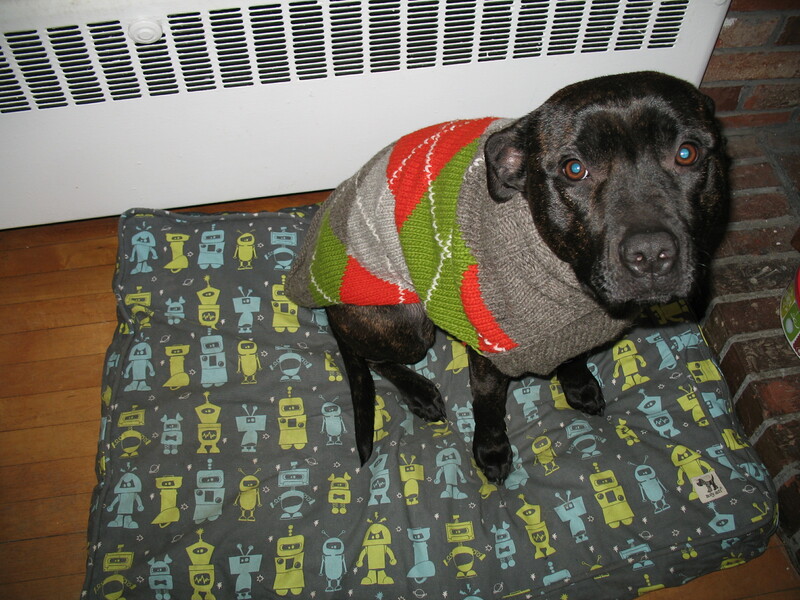 Made by folks who also make horse blankets, these fully lined fleece coats are very warm and they fit dogs so well. I highly recommend them for any shaped dog. Like sweaters, they slip over the head, so there’s no Velcro strap across their chest to bust open. And the extra coverage up front is good for cold climates where every exposed inch counts. There’s a ton of stretch in these snug coats (think Spanx for dogs), so what fits in the front, will also fit in the waist. Plus, they make x-long versions for wiener dogs. What up! We won this cheap-ish dog coat in a raffle years ago. It fits Birdie perfectly and she’s taking a nap in it right now. She told me the faux sheepskin shearling coat makes her feel rugged – like a rancher or a cowboy. Hey, as long as Birdie isn’t flashing anyone, it works for me. Do you have an odd ball dog that doesn’t fit into regular stuff? Tell me about your favorite coats and sweaters in the comments section! 2014 update: My friends at Fit For a Pit carry an amazing collection of dog coats and clothes that fit pit bulls and other chesty dogs. I love their products so much that, yes, this is an affiliate link. Havoc is a very active young dog. The only coat that I can keep on her and have stay in place while running, jumping, wrestling, is the Fido Fleece by premier pet products. Its all fleece and not water proof but it does pretty well as long as its not pouring out…the dog steps into the legs and it pulls up and around the dog velcros all down the dogs back and a velcro tab on the back of the neck..no wiggling out of this coat!! And no performance issues to speak of!! Maliniois tested and approved…. Check out Hurtta and D-fa Dog, they are made for active dogs. Hi, My dog Addie Mae is part pitbull and has the exact body-type you describe – very full chest with a narrow waist. I would add Kurgo products to your list of well fitting coats – they have a flotation device/coat combo that is a great fit and has a polar fleece insert or the floatation insert so it does double duty. Actually triple duty because the coat w/o either insert is a 3rd option that is water-proof and has very nice reflective tape. I have a custom coat for my pitbull mix made from Blue Willow Dog Coats. http://www.bwdogcoats.com/ They mostly market to the opposite type of dog – deep chested sighthounds, but since she custom makes them she can do any size/shape. Fits my guy like a glove and has a belly warmer that velcroes around the waist so he can run/jump/play and it stays perfectly in place. It’s waterproof fabric on the outside and fleece on the inside. When I have more money, I will be buying him the raincoat version, too! I missed your roundup last month – great tips! Birdie had a really hard time with Ruff Wear coats, but it may have been the specific styles we tried for her (or her chest is just ridonk). Glad they fit your pooches so well! Our sweet boxer/dino Shanti loves all dress ups. Her current favorite (wind chill in the negatives) is Zack and Zoey’s reflective thermal jacket which reflect body heat and is super warm. Also fits the chesty, small waisted figure. We love Duluth Trading Company’s “Grab Jacket”! It fits our barrel chested 70lb pit bull mix well and hangs down long enough to cover his hips, which is great since he has arthritis and they can get sore in the cold weather. 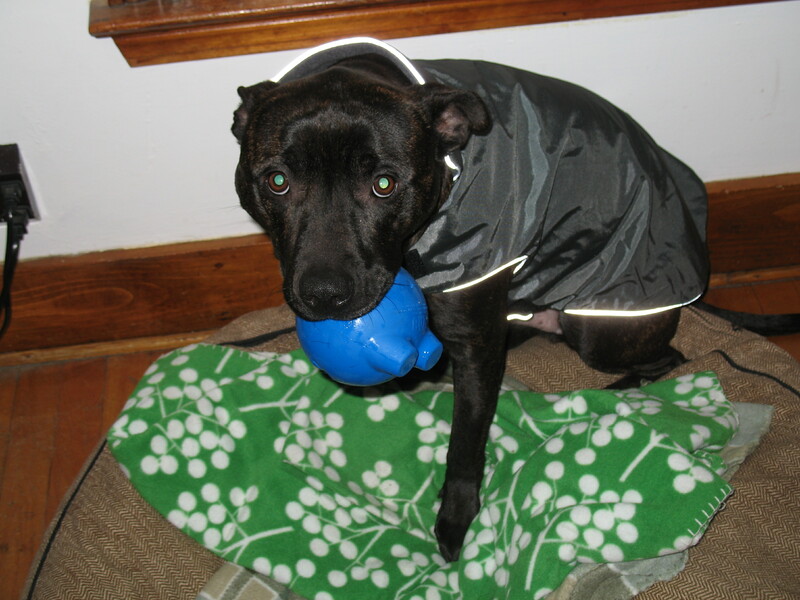 It is also fleece lined, has exterior pockets and great reflective bands that make him easy to see on night walks. Murphy is a wimp about the cold (who could blame him?). Being a Dobie, he’s also very deep-chested and wasp-waisted. As if that weren’t bad enough, he is enormous (he is a lean 98 pounds). I wanted to go the “Obtrack” route because a friend of mine with a similarly shaped/sized dog found success with this company, but they are uber-pricey. I haven’t had a lot of success with off-the-rack in general anyway because of Murph’s freakish proportions. A Cozy Horse coat to fit over Murph’s BLD harness is the next item on my with list! Nothing fits a sighthound unless it is made for a sighthound…they have deep chests and little waspish waistlines. Decotogs makes great pjs that fix, and Taylormade and Houndtogs make coats especially for sighthounds. So does Blue Willow but they are very pricey. Thanks for these suggestions. Reggie has a lot of junk up front (love that term!) even though he might not look it. He’s a Springer Spaniel. We’ve tried so many coats and nothing seemed to fit. I’ve just given up on anything Velcro. Now he wears a sweater which works well because it stretches to fit his frontal area. I’m a Doberman owner and they can be tough to fit. I actually started making my own fleece coats to keep my dogs warm in the Minnesota winters. I got talked into making some for online friends, and now have a little business going. I’ve done a few coats for pitties, too, and even a Bullmastiff (that was a challenge!). I try to keep the price low so the coats are affordable. I do have a Facebook page if anyone is interested – search for Made by Meadowcat. I also really like Fido Fleece and Hurtta. Another Dobe owner here. My blue boy has CDA — color dilution alopecia — so he has even less hair than a regular Dobe and he has the same fitting problems: deep chest, long back, sharp tuck-up. I’m a good knitter and a so-so-sewer so will make some outerwear for him. If any of your readers are on the knitting website Ravelry, there is a lovely sweater designed specifically for Greyhounds. It’s a free pattern called The Sidebutton Greyhound Sweater and it even has a turtleneck. If you use the Ravelry pattern search (greyhound sweater) you’ll find several patterns, including snoods. Lots of ideas there! We just started reading your great blog as recommended by your mom! We met her and the wonderful Lucy today as we will be working for Lucy now! We have a 90 lb greyhound and a 45 lb lab shepherd mix with a HUGE chest and skinny waist. We rarely found coats that fit her, but since adopting th grey we found http://k9apparel.com/ who makes very reasonably priced high quality coats guided by specific measurements. We love them! And we love your blog! Thanks for reading and for the coat tip Lauren! I’m so glad Lucy will have some new friends to hang out with during the day. I love that dog so much – take good care of her for me! I know you heard from your mom about Lucy, feel free to pass on any helpful tips if you’d like!! Hey Lauren, I wrote my mom an email last night with some ideas and told her to share it with you. I think the goal going forward should be to create some relaxed, positive interactions with no pressure on Lucy to do much of anything (with my mom there at the beginning). Just ignore her and let her come to you , if she’s feeling comfortable. Check out some of the other comments here – there are some ideas for sight hounds and other dogs built like your guy! what do you mean by the dog being a triangle? Do you mean the dog has a giant ribcage and from the side they look triangular?